Home > Past Buzz > We're Gonna Live Forever! An alumnus shares the magic of this year's High School of Performing Arts reunion. 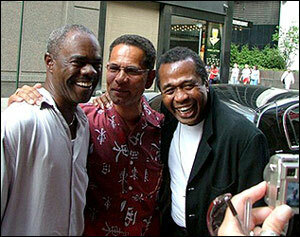 Glynn Turman, Calvin Morris, and Ben Vereen, Class of '65, at this year's High School of Performing Arts reunion. In the shadows of Times Square, out of the mists of time, a long-gone but legendary place reappears once each year. If this sounds like the plot of a golden-age Broadway musical, it's only fitting: The place in question is the High School of Performing Arts, which annually materializes in the warm recollections of returning alumni. Last weekend, the miracle happened again for me and hundreds of others. 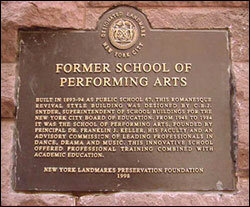 Immortalized in the 1980 film Fame , the school vacated the building in the Broadway theater district that it had occupied since 1948 when it united with its sister school, the High School of Music & Art, at the LaGuardia School of the Arts at Lincoln Center in 1985. During renovation, the unoccupied 19th-century structure on West 46th Street suffered a catastrophic fire; it emerged from the conflagration, with its famous facade intact but with a completely new interior, as the JKO School of International Careers. For one weekend each year, it again serves as the mythic home of youthful hopes, artistic dreams, camaraderie, and loyalty for alumni of good old "P.A." into dance belts and leotards have expanded. The view from 46th Street has changed as well: seedy hotels and a questionable bathhouse have been replaced by sleek corporate towers. Still, nostalgia reigned as old friends easily reconnected, and voices seemed to rise again to the teen-aged pitch that generations of teachers strove to tone down. Among those present at this year's reunion were 1965 alumni Priscilla Lopez (of A Chorus Line fame), Glynn Turman (who created the role of Travis Younger in the original Broadway production of A Raisin in the Sun ), and the one and only Ben Vereen (currently co-starring in Wicked ). Lopez's P.A. connection was forever immortalized in A Chorus Line : Her character Morales's song "Nothing" is said to have been inspired by a drama teacher at the school. Vereen's triumph in 1972's Pippin made a distinct impression on the school as well; the successes of alumni were always posted on a bulletin board near the auditorium to inspire, if not intimidate, the students. 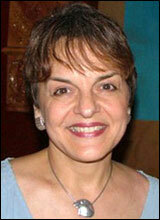 "For a while, 'Magic to Do' was a very popular song to perform in the drama department," recalled Ben Kushner, '75. Said Kushner of Lopez, Vereen, and Turman, "To their '65 classmates they're just classmates, I guess -- but to us, they're bigger than life." Several 1975 alumni admitted to having "mad crushes" on Turman from their time at PA. They have followed his career, which has included movies such as Cooley High and appearances on TV's A Different World . (He also had a high-profile marriage to Aretha Franklin!) Turman no doubt won new fans last weekend when, in Saturday's reunion cabaret show in the school auditorium, he spontaneously distilled his P.A. years into a spellbinding 15 minutes of performance art. Another very special highlight of the show was Lopez's breathtaking a cappella rendition of "Nothing." The plaque on the building at 120 West 46th Street. It's important for all of us to return to the old building; we lived so much of our lives in the nearby coffee shops, at Howard Johnson's (there were still two of them right around the corner in the '70s), and at the Automat. Most of those hangouts are gone now, and even the one remaining HoJo's will be history soon. But my class is already making plans to celebrate our 31st high school reunion on 46th Street next year.